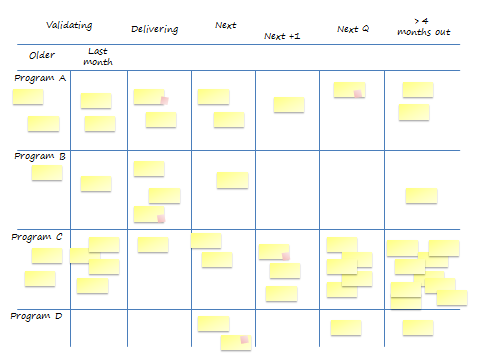 Better Projects: Reverse the Portfolio board: Start with what we learned. Reverse the Portfolio board: Start with what we learned. I have been putting a view of a portfolio of programs in front of an executive team. My agenda has been to increase the discussion about the value and lessons learned from projects. There is an underlying assumption (by me) that we can ‘do better’ by reflecting on the lessons that are available in completed projects rather than quickly moving on to the next thing. It reflects the passage of time. The now vertical column separates the past and future. 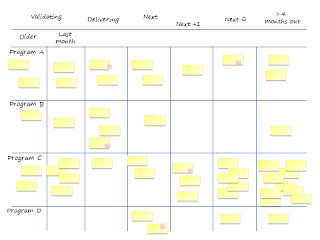 Co-incidentally I discovered a colleague Kim Ballestrin has written up an interesting blog post on doing the same thing in a personal kanban context. Check out her experiment and insights here. It's quite an interesting post that reinforces my view that this is the right way to go.